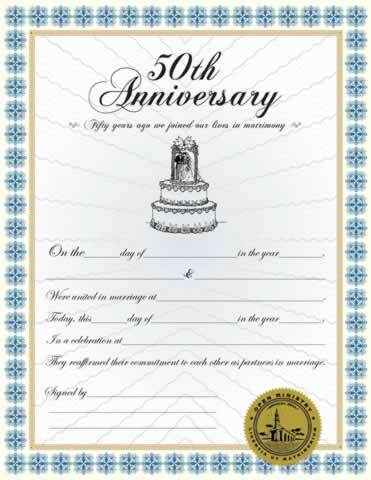 This personalized 50th Anniversary Certificate has space to write date of marriage, names of the couple, location of marriage, date and location of anniversary, signature of witnesses and person solemnizing the marriage. Decorated with our gold embossed ministry seal. The certificate was well done, very professional, yet sentimental as well. The participants were very pleased, and surprised. The ceremony was held at a local clubhouse at a golf course, happy days.